An indispensable and lavishly illustrated guide to creating a garden that attracts and sustains butterfliesButterfly gardening creates habitats that support butterflies, connecting us with some of the most beautiful creatures in the natural world and bringing new levels of excitement and joy to gardening. 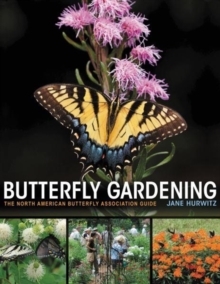 In this engaging and accessible guide, lavishly illustrated with more than two hundred color photographs and maps, accomplished butterfly gardener Jane Hurwitz presents essential information on how to choose and cultivate plants that will attract a range of butterflies to your garden and help sustain all the stages of their life cycles. An indispensable resource for aspiring and experienced butterfly gardeners alike, Butterfly Gardening is the most gardener-friendly source on the subject, covering all the practical details needed to create a vibrant garden habitat that fosters butterflies. It tells you which plants support which butterflies, depending on where you live; it describes what different butterflies require in the garden over the course of their lives; and it shows you how to become a butterfly watcher as well as a butterfly gardener. While predominantly recommending regionally native plants, the book includes information on non-native plants. It also features informative interviews with experienced butterfly gardeners from across the United States. Pages: 288 pages, 300 color illus.